The Ashryn Lodge is warm, inviting and cheerful, so come relax! You can snuggle up on the newly screened deck in front of the outdoor fireplace and read a good novel or simply unwind in the hot tub, or play some board games we have available. Watch the morning sunrise through the french doors off the master bedroom while still in bed! - Harrah's Casino, Murphy, NC just opened in September and is less than a 30 minute drive. -Appalachian Trail for hiking and biking, including Benton McKaye, which include short hikes to Fall Creek Falls, Desoto Falls, Long Branch Falls, Swinging Bridge, Amicalola Falls and Ruby Falls. -Horseback riding at Blance Manor, Adventure Trail Riders & Double D Ranch. -Blue Ridge Theater and farmers market on the weekend. -Toccoa River Trails, Aska Adventure Area. -Lake Blue Ridge, which is the cleanest lake in Georgia for Swimming, fishing, water skiing, jet skiing & boating. -Lake Chatuge which borders Georgia & North Carolina. -Atlanta & Chattanooga are only approx 90 minutes away, so you can enjoy two great aquariums, light show and picnicking at Stone Mountain, or take in a Baseball game with our Atlanta Braves. -Local Houses of Worship include Baptist, Methodist, Church of Christ and Catholic. -Numerous restaurants abound in Blue Ridge, Blairsville, Hiawassee and Murphy, Tennessee which is 45 mins away. Ashryn Lodge is 90 minutes from Atlanta and Chattanooga, TN. surrounded by National Forest land and located near Lake Blue Ridge and a short drive to Lake Chattuge. Our cabin was built in 2006 and is your great escape from the City in the mountains, but has all the amenities and luxuries of home including a fully equipped kitchen, satellite TV with 40' Flat Screen for College Football & NFL Games, rustic décor, private 6 person hot tub on the lower deck, air hockey table, private master bedroom with a sun deck and Jacuzzi tub, beautiful all season mountain views, and much, much more. The cabin is furnished with your family in mind. We have numerous DVD's, a selection of board games, and an air hockey table. Our cabin is all wood on the inside including hardwood floors. One of the most charming features are the 2 gas fireplaces, one in the family room and one on the outside deck. The cabin has lots of windows including two story windows in the family room and 2 1/2 decks, including a sun deck off the master bedroom. The master bedroom has a large comfortable king size bed; the guest bedroom has a comfortable queen size bed and in the family room is a sofa that converts to a queen size bed. The cabin also has a washer and dryer for your convenience as well as high speed wireless internet service. 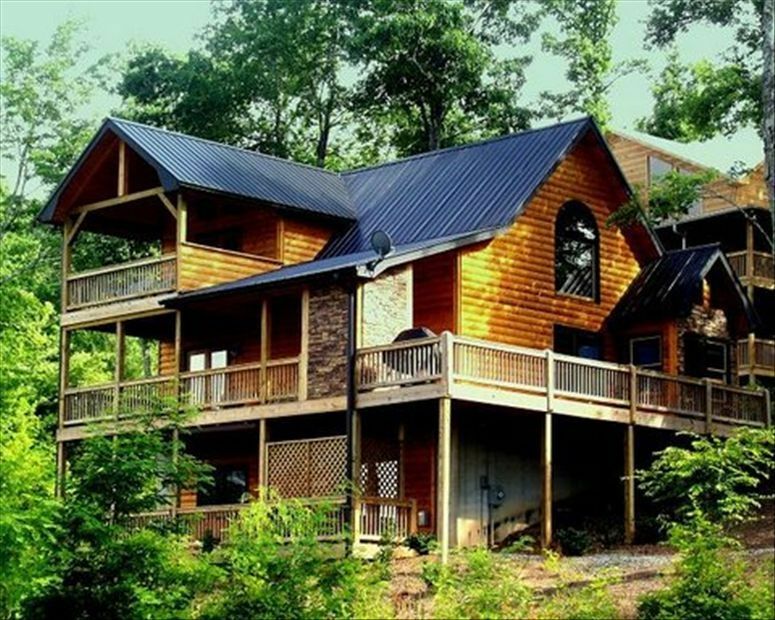 For outdoor adventures, our cabin is located 5 minutes from beautiful Lake Blue Ridge. Other activities include a ride on the Blue Ridge Scenic Railway to Copper Hill, TN., also horseback riding, Kid's Fun World, Bert's Pumpkin Farm, Merciers Apple Orchard and store, and the Swan Drive In Movie Theatre. We hope you will consider our little bit of heaven in the beautiful North Georgia mountains. Holiday weekends require a 3-night minimum. MLK Day, Presidents Day, St. Paddy's Day, Memorial Day, Labor Day, Columbus Day and Veterans Day. Thanksgiving and Christmas, please check with owners. PAYMENTS ARE MADE THROUGH VRBO'S SECURE WEBSITE. We bought this cabin when we were a family of four for weekend getaways. When we added our puppy to our family he loved it too so we opened our rentals to include small dogs. We choose this cabin because of the view from the decks and the bed in the master bedroom. It is a 90 minute drive from Atlanta and easy for Florida visitors to get to. The five minute drive to Morganton beach is great, and the clear skies while relaxing in the hot tub awesome. 50' flat screen TV in family room. 40" flat screen in master bedroom. We would definitely return. Love the pet friendly option! Beautiful cabin. Excellent view! First time doing home away. Excellent! Definitely recommend this renter 100%. Thanks! I was very happy with all aspects of this cabin and would absolutely stay there again! Thanks for being such a great host! Thank you for your kind words. We are glad who had a wonderful time in the north Georgia mountains and hope we can accommodate you in the future. Our family of 4 recently visited and our expectations were exceeded. What you see in the pictures is what you get...lots of space, plenty to keep the kids entertained, and some great places for quiet reading, etc. The screened in back porch with the fireplace was a great touch. The owners were very quick to respond to questions. Highly recommended! The Ashryn Lodge was perfect for our family to have a little post-Christmas get-a-way. We woke up to a gorgeous view of the mountains and cabin is beautiful inside and out. It is also located a perfect distance between Blue Ridge and other close towns. I would highly recommend this cabin. The cabin was beautiful and perfect for our week getaway! Thank you!!! Cost is for 2-adults and 2 children. Additional adults are $25.00 per night. All major Holidays such New Years, Presidents Day, Valentines Day Weekend, Memorial Day, Independence Day, Labor Day, Columbus Day, Thanksgiving and Christmas require a minimum 3-night stay.